Most club players struggle at finding an opening system that is solid-enough they can trust, yet simple enough they don’t need to invest months to understand. They waste tons of time learning 5-6 different openings to counter whatever their opponent throws at them… The number of lines to remember grows exponentially, preparation time triples and the whole process turns into a huge mess! But most importantly, their RESULTS do not improve. They still get in trouble in the opening, face unknown deviations and never see those perfect “book examples” of the middlegames they try so hard to achieve. They start studying more lines… and the opening preparation turns into a complete nightmare, mentally draining the player and making him feel insecure. If it does, and you are tired of studying the endless number of lines and variations that you never see in your games, we have something for you. The idea is fairly simple. Instead of learning 5-6 different openings, why not learn a single opening system that you can use against whatever your opponent plays? The key advantage is you can truly focus on this one opening system and understand it 5 times better than bunch different openings. You don’t need to be a rocket scientist to realize that if you understand an opening system 5x better, you will win way more games! A great example of universal openings is the English [1.c4]. This system can be used against a wide variety of Black’s responses and it is fairly easy to understand. English is a “low-theory” opening and a perfect choice for those who don’t have months of preparation time. At the same time, it leads to solid, reliable positions which are flexible and aggressive enough to outplay even much more theoretically advanced opponents. 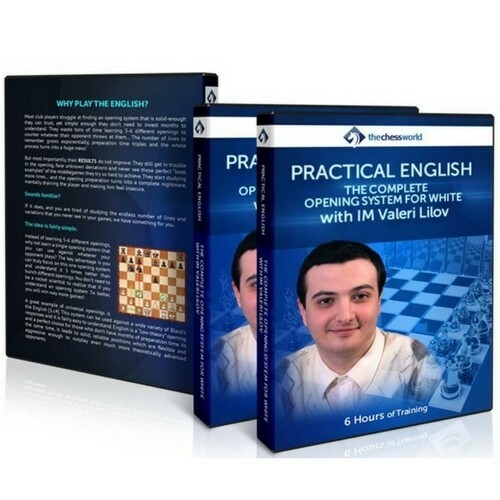 In this 6-hour course, IM Valeri Lilov uses his innovative approach based on understanding a very specific “beat sequences” and key plans to minimize preparation time. This is a much more effective way of learning than the traditional methods. Not only it saves you tons of time, it will also make sure you understand the most important elements of the system allowing you to use it in your games easily and flawlessly.